With big screen, high definition TVs becoming cheaper every day the home theater setup is becoming more of a possibility for the common man. But what many people fail to realize is that while those shiny new TVs have crystal clear pictures, the tiny built-in speakers are generally very underwhelming. So to complement that powerful TV you need a powerful set of speakers. 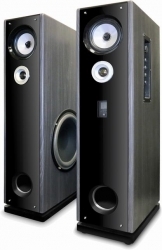 The 602 is targeted at home theater users looking to add a pair of high quality speakers without the hassle and expense of an external A/V receiver. The 602 is designed with simplicity in mind and is ready to use straight out of the box with most HDTVs, DVD players, gaming consoles, karaoke and more. It contains built-in amplifier and connects to most HDTVs via RCA audio jacks. No more external A/V receivers! Much of the effort in designing this pair of 602 went towards smoothing out unwanted distortions and widening the frequency response to deliver near full spectrum sound. The 602 use trusted technologies such as: premium woofer and tweeter cone materials for deep lows and crystal highs, and precisely shaped wooden cabinet to absorb unwanted vibrations. The 602 delivers great aural experience that is easy to use.